Delivery of components for CESR CHESS-U systems is well underway. Short summaries for various systems follow below. Utilities: The increased power for the Double Bend Achromat (DBA) optics requires increased water flow for this region. Larger heat exchangers and pumping (two 75 HP pumps plus a spare) are being installed during the 2017 summer shutdown to reduce work during the 2018 installation and to provide space for a small Energy Recovery Linac project in collaboration with Brookhaven National Laboratory. Most of the plumbing from the pumping facility to the storage ring has been installed during short accesses earlier this year. Vacuum Systems: Aluminum extrusions for the CHESS-U vacuum system have been bent to shape, following the 31.4 m radius curvature of the DBA magnets, and are being machined to final dimensions. In order to provide an exit channel for the CHESS undulator beams, a special machined chamber is required with a common entrance aperture for both electron and photon beams, and separate exit apertures for each. Between the exit apertures, a special absorber must be installed to absorb the high power density of synchrotron radiation from the bending magnet. Two of these chambers have been received and meet specifications. Non-Evaporable Getter (NEG) pumping is used along the vacuum chambers where long dipole magnet poles do not allow ports for other pumping methods. A test chamber with the final NEG design has successfully undergone over 100 activation heat cycles. After initial conditioning we anticipate 2-3 activation cycles per year. 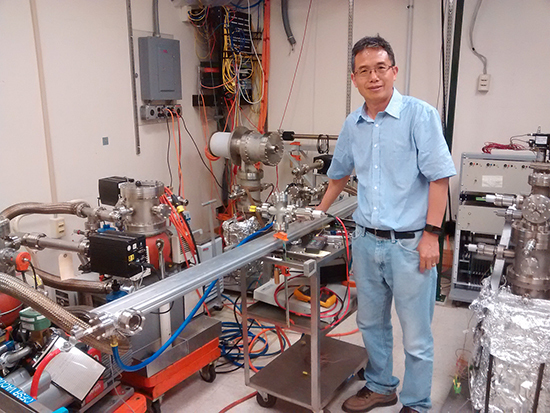 Vacuum Scientist Xianghong Liu with NEG pumping test chamber. Magnet Systems: Delivery of production coils for quadrupoles and dipole-quad magnets started last month with a complete girder set scheduled for each month. Machining of small trim magnets and fixtures has started. The first assembled girder (less trim magnets) will be transported from the assembly area across Rte. 366/Dryden Rd. to Wilson Lab later this month. The position of the magnets (two quadrupoles and a dipole-quadrupole) on the girder will be carefully measured before and after this move to assess suitability of fixtures and clamps. Quadrupole coils awaiting electrical and water testing. Power Conversion: Most major components for the magnet power converters are on order. Electronics crates, current regulators, PC boards, primary power supplies and racks are being delivered. Layout of the many cable runs is in progress. Once run lengths are determined, pre-wired cables will be ordered. We have prepared an automated cable tester to verify correct wiring before installation. 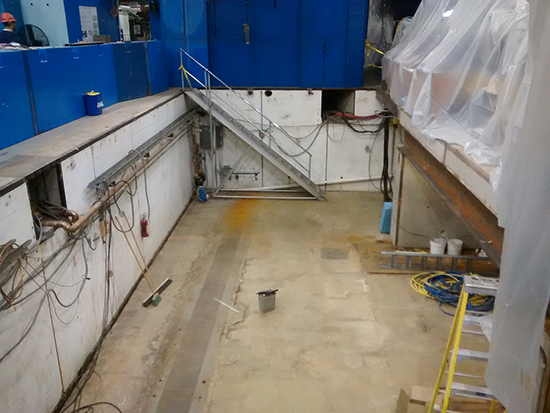 Facilities: The covering over the 50x50 foot pit formerly housing the CLEO high energy physics detector will be replaced with 12” precast concrete slabs supported by 24” I-beams that will support CHESS hutches and CESR shielding. The old floor has been completely removed in preparation for installation this summer. Empty pit formerly housing the CLEO HEP detector. CESR is under the plastic covers on the right. CHESS-U is on track for installation in July-October, 2018.